At Republic Master Chefs, we offer you premium restaurant linens and uniforms, delivered on-time and fresh when you need them. Plus, we offer dust control, mat and restroom services to help you keep your restaurant clean at all times. We understand that as a restaurant owner or manager, time is your most precious commodity. That’s why our mission is to take as many worries off of your plate as possible. We recognize that failure to properly manage your textile inventory can create issues for your business. Uniforms and linens are one part of your operation that we believe you shouldn’t have to worry about. 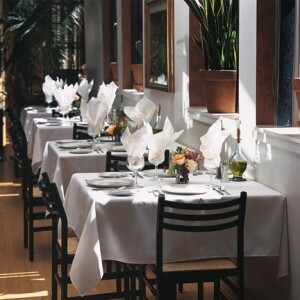 We have decades of experience in textile service, so let us take care of your restaurant rental linen and uniform needs. You get more time to focus on your restaurant without sacrificing attention to detail in laundering. Quality to us means that you get clean, pressed and well-made uniforms and linens that add to the professional atmosphere of your restaurant. We don’t cut corners and we stand behind all of our products, 100%. No matter what kind of restaurant you run, we offer a selection of restaurant uniforms and linens that can fit the aesthetic of your business. With 80 years of experience, Republic Master Chefs understands the needs of the food and beverage industry. We service small and large establishments from snack bars to casual dining and everything in between. Join our family of satisfied customers to find out what makes Republic Master Chefs a local leader in restaurant textile rental. Contact us today to learn more about our products and services!